The last day of November already! When we read PIZAZZ's notes on this anchorage, Randy and Lourae said that there are so many sailboats visiting that the locals called it "Puerto Valero" (Port Sailboat). Well, we discovered on our hike to the main road to Puerto Colombia that it is now OFFICIALLY Puerto Valero! However, I think this is less in honour of the visiting boats than for the kiteboarding and windsurfing facilities here. 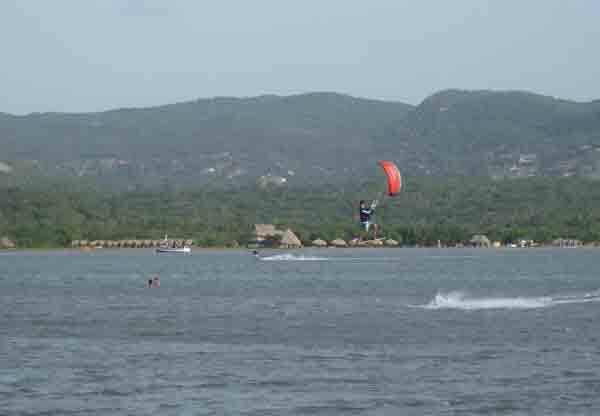 The wind blows constantly and the bay is shallow with a sand bottom, making this the premier spot for wind sports in Colombia. Brian, on DARRAMY, has signed up for eight hours of kiteboarding lessons- brave soul! He describes the experience as balancing on a tea tray while trying to control a giant kite. Brian and Sue have been here more than a week and even hired a ride into Purto Colombia for provisioning- riding pillion on motorbikes! 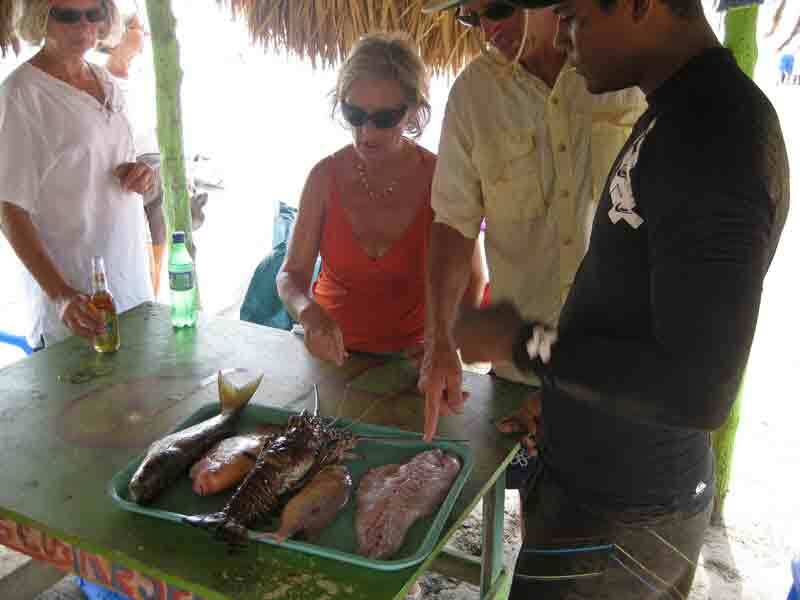 They also arranged a lunch for all of us via Martin, his kiteboarding instuctor. Along the spit it is a peaceful world. There are many salt ponds with abundant bird life- herons, egrets, spoonbills, among others. It is a world away from Rodadero! Before our lunch was prepared, our hostess brought out a tray with the various kinds of fish available for us to choose from. Dave and I shared a fantastic turbot. The side dishes included platanoa (plantain), tomatoes and wonderful coconut rice. We all shared "popcorn" chicken and fries that put the Colonel's recipe to shame! An elegant lady carrying homemade desserts (postres) in a huge bowl on her head provided us with treats to round off the meal. There were also vendors with avocados and mangos. A couple of ice creams were purchased- for almost the same cost as the meal! I must say the vendors were very "green" in that they carried trash bags at their waists and presented the clients with just the food, not the packaging! It was a wonderful way to sample Colombian life! Afterwards I managed to get the rest of my laundry washed, ready for drying today. It is so nice to have clean clothes again (and much more sweet-smelling in the aft heads). However, one of Dave's t-shirts "escaped" while we were walking. So, once gain, we have inadvertently left a souvenir of our visit.